Democratic Party candidate John Kerry has formally accepted the nomination to run for US president, vowing to rebuild America's alliances around the world. In a major speech ending the party's convention in Boston, he promised to fight for a stronger America, saying strength was "more than tough words". He also attacked President Bush's policy on Iraq, and said that he would not "mislead the country into war". A successful speech is seen as vital for his chance in November's election. The BBC's Rob Watson says that the speech went down extremely well with delegates, but the question now is how will it have played in the wider country. In contrast to Democratic convention speeches in recent campaigns, Mr Kerry's address was heavily weighted toward foreign policy and security. The speech was preceded by a film of his life story, highlighting his experiences as a soldier in Vietnam. Then, accompanied by his wartime crew mates, the candidate took to the stage. "I defended this country as a young man and I will defend it as president," Mr Kerry said. He said that as commander-in-chief he would "never hesitate to use force when it is required", and would be prepared for the US to go it alone. 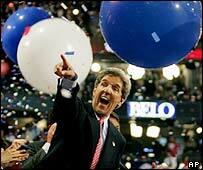 "I will never give any nation or international institution a veto over our national security," Mr Kerry said. The New York Times counted that Mr Kerry used a variation of the word "strength" 17 times. The Democratic candidate also launched a blistering attack on the conduct of the Iraq war. He sought to contrast himself with Mr Bush by highlighting the faulty intelligence used by the administration ahead of the conflict. He nailed it. His finest hour showed what Republicans didn't want to see, that he would take them on both barrels blazing. "I will immediately reform the intelligence system so policy is guided by facts and facts are never distorted by politics." To the 4,000 delegates and to the wider television audience beyond, he said he would restore America's tradition of restraint. "We only go to war because we have to," he said. He added: "We need to rebuild our alliances so we can get the terrorists before they get us." Mr Kerry described this presidential election as the most important of their lifetime. The US, he said, was a country at war with terrorism and a country with economic problems at home. "In these dangerous days there is a right way and a wrong way to be strong. Strength is more than tough words," he said. Mr Kerry also outlined his domestic policies. He pledged to improve the quality of life for Americans, with tax cuts for the middle classes and a health care plan to save families up to $1,000 a year on their premiums. "America can do better, help is on the way," he said. The speech concludes the convention and kicks off a three-month battle with Mr Bush, who intends to resume campaigning after spending the week at his Texas ranch. Mr Kerry hopes his four days in the spotlight provide a measurable surge in public approval, known as "bounce," which sometimes has given nominees a double-digit boost in the polls. The latest opinion poll, taken during the Democratic convention but before Mr Kerry's speech, suggested Mr Kerry and running mate John Edwards were leading President Bush by five points. The Zogby America survey gave the Democratic ticket a 48-43% advantage. "Kerry pledged to put money back in the pockets of the poor"
If elected president, what would John Kerry do for America?